On my way back to Moab from Bishop, CA I spent a night on some BLM land right outside of Green River, Utah. 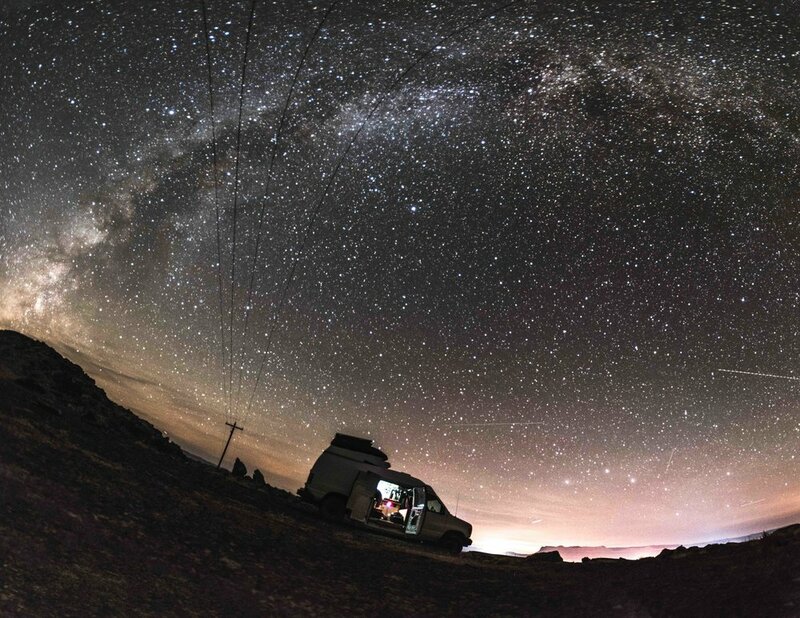 It was an incredibly clear night and I took this photo of the Milky Way above the van, and the light of the rising moon illuminating the horizon. I visited Hilltop Hot Tub near Mammoth, CA with a friend for the November 3rd full moon. This man-made stone pool is fed by a hot spring and is surrounded by mountain panoramas. 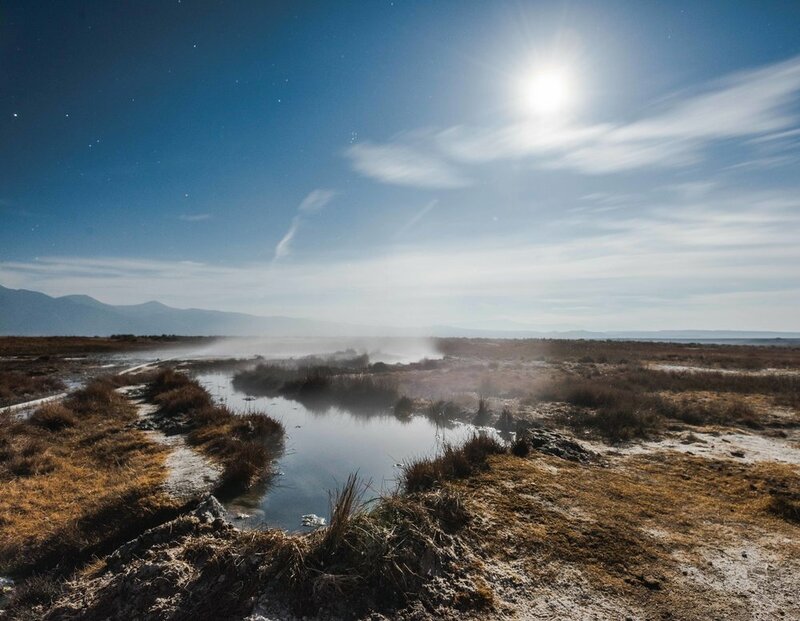 I took this photo of the steaming creek next to the tub with the beaver moon shining brightly above. The local crag in Moab is called "Wall Street"
Right off of Potash Road and only a few minutes away from town you can toprope belay from the seat of your car if you want. 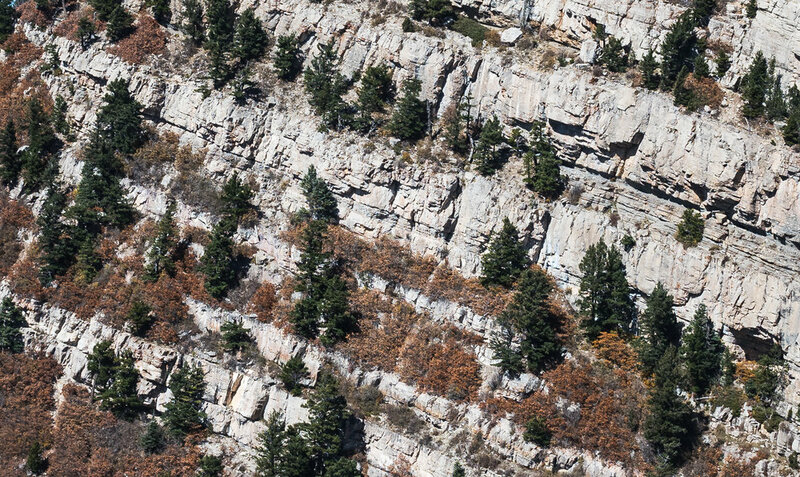 With a good mix of sport and trad climbs and its proximity to the city, Wall Street is pretty cushy climbing and that means it can be pretty crowded on the weekends. Nevertheless, it's a fantastic spot with some great classics. Here's a couple shots of my friend Sam Jarvis on "Fist Full of Potash" 5.10 Trad. Bishop Pass is a breathtaking sight in fall; dozens of subalpine lakes sit amidst fall colors and cold rocky peaks in every direction. Its almost ice skating season up in these lakes and the water in our backpacks was freezing as we walked back to the cars after sundown. On my way out to Bishop, California I managed to get myself severely stuck on a dry lakebed somewhere in Utah. I drove out onto the lake to take some photos and it wasn't quite as dry as it seemed. I ended up with my rear wheels a foot deep in the mud and feeling like a fool. After a few hours of trying to dig myself out and put rocks from the edge of the lake beneath my tires I managed to flag down someone with a truck on the highway. After telling me that I was completely f****ed, he agreed to try and pull it out. I took this photo with the almost full moon rising over the valley, and my van on solid ground once again. 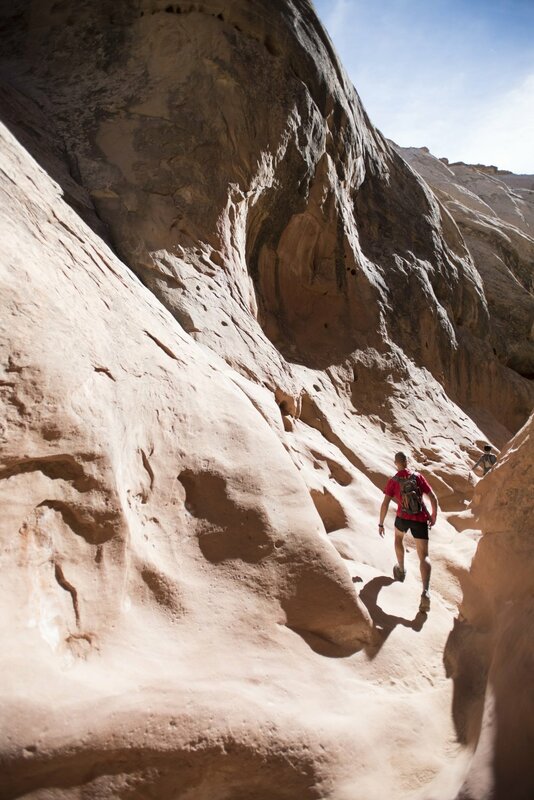 Little Wild Horse Canyon is a slot canyon in the San Rafael Swell in Utah. While visiting my parents in Moab, we took a day trip to check it out. The slot canyon is a 4 mile out and back hike, with an option to hike an 8 mile loop that returns to the trailhead via an adjacent canyon. Sheer walls and smooth channels of sandstone have been chiseled away by thousands of years of water gushing through the canyon. The low point in the slot is solid rock. With no soil for the water to seep into or any direct sunlight to evaporate it, the water is knee-deep and cold. We decided to hike the 4 mile option and did some scrambling up a few of the side canyons on our way back to the trailhead. 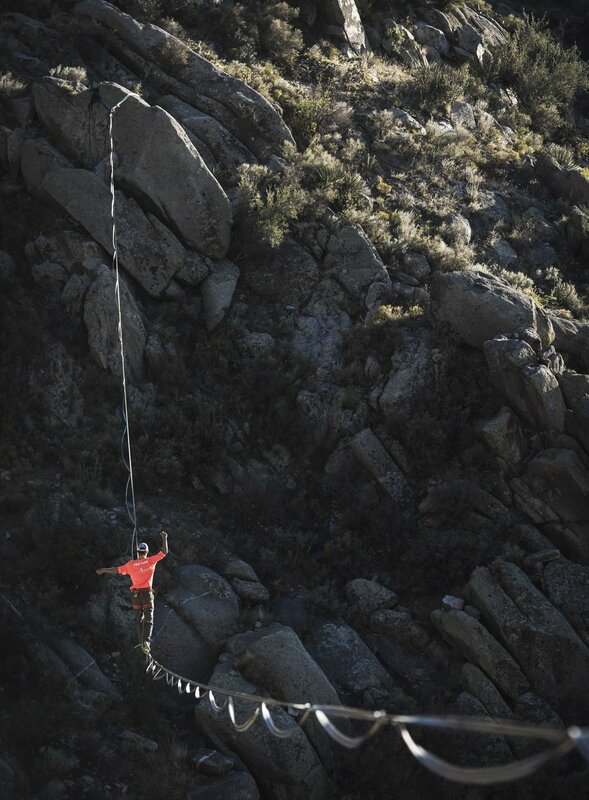 This past weekend the Slacklife New Mexico team set out to the Sandia Mountains to rig a massive highline. In Echo Canyon along the La Luz trail in the Sandia Mountains there is highline potential at lengths from 70 to 400 meters, with some of the most beautiful exposure the United States has to offer. 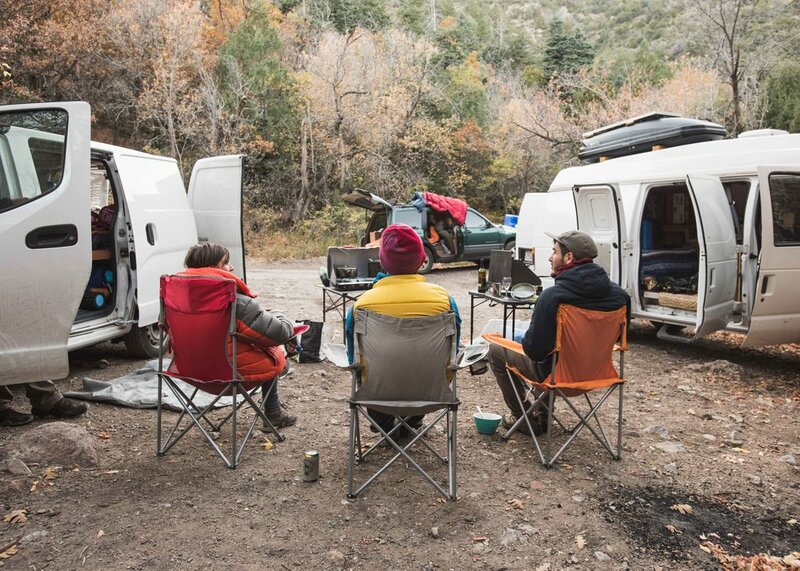 We drove up into the mountains on Friday morning with the intention of rigging a 250 meter highline, and spent our first day scouting and building the anchors for the line. With the wind gusting, we would not be able to get the tagline across with the drone, and resolved to come back before the sun was up in the morning. That night, we made camp off of a forest road on the backside of the mountain and went to bed early. The second morning of the project we were forced to come to terms with the weather conditions--we had built the anchors the previous day, but there was no way we were going to get the line up with the projected wind forecast. It had changed drastically overnight and it seemed that the calm we were hoping for was not going to come. Disheartened, we packed up, and I took this photo of echo canyon as the first remnants of sunlight began to peek over the rim. As a fallback plan, we decided to return to Albuquerque and rig the 137 meter line "The German's in Town" The wind forecast for the city was much better than that of the Sandia Crest and we managed to get the line up in just a couple hours on Sunday morning. Friedi Kuhne on "The German's in Town"
Back in Albuquerque for a while preparing for a big highline project in the Sandias. Chris and I decided to take a day hike on the crest and visit the spot that we intend to rig the line. Along the way we stopped at Kiawanis cabin, a stone building built by the Civilian Conservation Corps around 1930. While staying in Jemez, New Mexico, we decided to take a trip to some hot springs in order to unwind from the past week of highlining and climbing. The springs are located along forest road 376 on San Antonio Mountain. We decided that our vehicles wouldn't be capable enough on the rough and washed out road that leads to the trailhead for the springs--any 4x4 vehicle would be able to do it easily, but with our vans we decided it was better not to risk it. Instead we parked at the intersection of NM state road 126 and forest road 376, and hiked 5.6 miles into the springs. Nestled on the side of the San Antonio mountains, the springs consisted of a series of cascading pools. The top was the biggest and hottest, and the pools were milder as you approached the bottom. On a Friday afternoon it was a pretty busy place, but everyone there was respectful of the area and the people around them. The layout of the springs meant that it did not seem crowded even with a few dozen people there. A 1.5 hour journey to Tent Rocks National Monument turned into an all day expedition when google took us onto some back roads. About 10 miles in, it was too much for Chris' minivan "Bon Mi," and we had to double back and take an alternate route. We made it to tent rocks with only an hour until they closed the trails. Hiking through the slot canyon and towering geologic features at a pretty fast clip, we tried to make it to the top before the rangers started to usher people back down the trail. We made it to the end of the short 1.6 mile trail with not even a minute to spare, and walked back to the parking lot with the rangers close behind. Near the bottom of the canyon we found this tree with a beautiful, massive root system, it seemed to be standing guard at the mouth of the canyon. On Tuesday Peter and I rode the Sandia Tramway to the crest of the mountain, and walked the La Luz trail back down to where the van was parked. The tram is the second longest in the world and offers some magnificent views of Albuquerque and the mountain features in the Sandias. From the crest of the mountain back to the van, the hike was approximately 10 miles long. Peter and I managed to do it in about 4 hours which included significant pauses to scout highlines. We found a magnificent spot near the top of the La Luz trail with easy access to lines up to 250 meters. While I was living in Europe over the last year I made lots of friends and invited a great many of them to come visit in the United States. Peter was the first to take me up on the offer. Originally from Germany, he now teaches Linear Algebra at Purdue University in Indiana. With two weeks off of work, he messaged me to see if I was available to do some travel in the southwest. I picked him up from Flagstaff on my way to the Northern Arizona Highline Gathering, and afterwards we hit the road towards New Mexico. We will be spending the next week or so traveling together to hike, climb, and highline. Paradise forks is a canyon about an hour north of Flagstaff Arizona. A highlining and climbing paradise with towering pine trees and sheer basalt faces that boast iconic trad climbs, it was the chosen venue for the 2017 Northern Arizona Highlinine Gathering. With around 60 people in attendance and 12 highlines, it was an intimate gathering with workshops on knots, rigging, mindfulness, and more. Despite being the smallest organized highline gathering that I have attended, the planning done by the organizers was some of the best that I have seen. Rescue bags, rig checks, LNT principles followed, primitive toilets built, attention to every aspect of safety for everyone involved. The one thing that never fails to inspire me is the limitless warmth and compassion that one feels within the eclectic assemblage of dirtbags that is the highlining community. It has been a constant in every gathering I have attended, and this one was more exceptional than most. Highliners are creative, talented, driven people who are drawn together by a bond of passion for this unique sport, and each time I go to a gathering I am touched by the generosity of everyone there. NAZHG was even more exceptional than most in this regard, and I left with lots of new connections and friends. While at the Northern Arizona Highline Gathering I met someone who I had spoken to online, but never met in person. Caroline Dignes is an extremely talented aerialist and she rigged her silks on several highlines throughout the course of the festival. Here are a few of the photos that I took of her. New Mexico's newest and longest highline is 140 meters long, and looks down on the city from the foothills of the Sandia Mountains. We came to Whitewash on Sunday afternoon with hopes of putting up a highline, and by the evening we had done it. A two person team, we had managed to scout and rig the line in about 4.5 hours. We finished just as the sun was setting -- I took this photo of Clayton on the line as the moon rose above the mountains behind me. 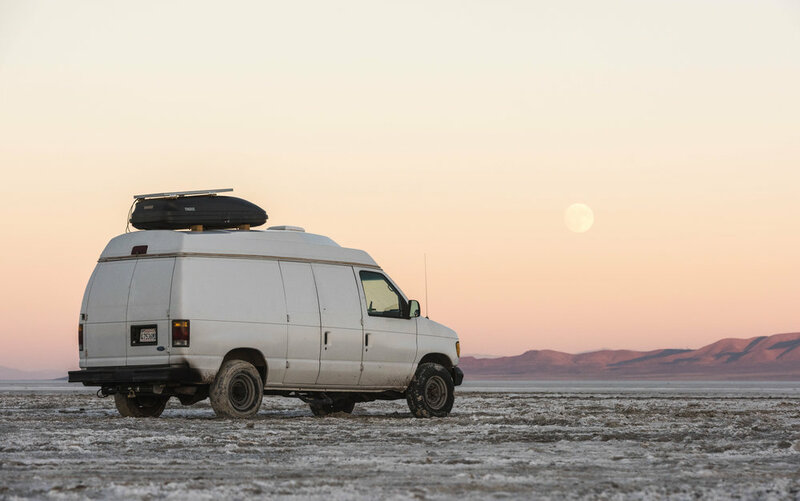 On September 7th, 2017 I moved into a 1994 Ford Econoline E350 conversion van. For the next couple years, it will be my home as I travel the United States to photograph 4 x 5 film landscapes, and adventure of all kinds.